Spurs resumed where they left off before Christmas with a home win over Swansea on the 5th. It was a hard fought game as the visitors defended deep closing down in midfield. The only goal of the game came when Richards robbed a defender and crossed for Maghoma to score. Spurs increased their pressure in the second half without being able to add to the single goal. On the 12th Spurs travelled to Brighton where they won 4-1. It was not a good first half but they took an early lead when Parrott headed in a cross by Cirkin. After Brighton hit a great equaliser Spurs went up the other end for Richards to score from a run and cross by Bennett. Spurs were better in the second half with Bennett scoring at the far post after the keeper had saved from Parrott. White had a penalty saved following a foul on Parrott and the striker got his second after good play around the home area. Markanday had to go off with an injury leaving Spurs to finish with ten men, the same as Brighton as his attacker was red carded. Spurs again finished the month top of the Southern Group having gone half the season unbeaten. Spurs travelled to Derby on the 25th for a quarter-final match, but were well beaten by a determined rams side who are on a good run. Spurs were badly affected by injuries and tried a different set up that did not work. They conceded early and could not make their passing style work against a solid defence. They were much better in the second half with a few positional changes but having to chase the game they left themselves open to a second goal which finished their interest in the competition. Spurs travelled to Borehamwood to play Arsenal in the fourth round on the 17th. Spurs dominated the first half taking the lead early when they carved through the Arsenal defence with Parrott setting up Shashoua for a tap in. The hosts leveled when White was caught in possession but ended the half with a lead when a cross by Cirkin was moved on by Maghoma to Bennett at the far post. Arsenal stepped up in the second half winning a penalty to level the scores by full time. In the first period of extra time the hosts went in front and then got a fourth. They added a fifth in the second period to inflict Spurs first defeat of the season knocking them out of the cup. Spurs had chances to open a gap in the first half and paid for not killing the game off. Spurs began the month with a home game against high flying Liverpool at Stevenage on the 7th. Spurs had a changed formation to suit Jannsen up front. It took a while for them to settle but finished the half on top. In the second half they went back to the ususal formation and scored quickly thanks to Georgiou moving to the left flank. He provided the initial cross for Sterling that was saved but the striker scored when the ball was played back in. A brief spell by the reds saw them get an equaliser before Spurs finished the stronger. But could not get a winner and had to settle for the draw. Spurs travelled to Dagenham on the 13th to play West Ham. With both sides playing passing football it was still a tight but entertaining game with both sides having spells on top. Early pressure from the hammers produced a penalty from which they scored. Spurs equalised when Sterling got through to set up Janssen for an easy finish. Before the break Sterling won a penalty but his kick was saved. 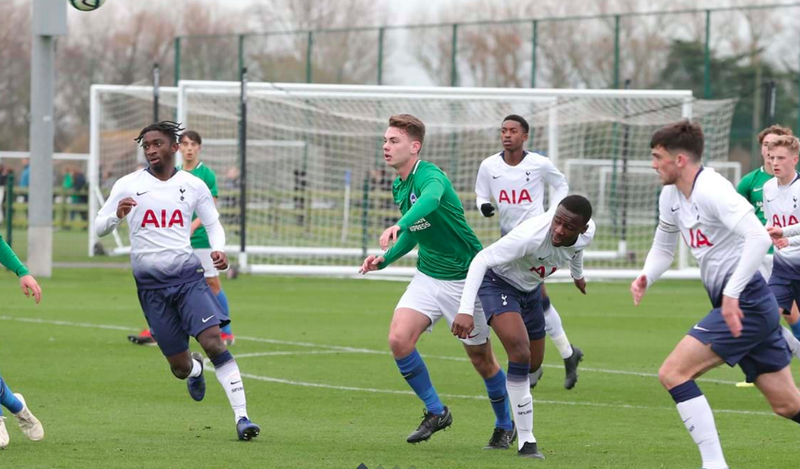 Spurs began the second half strongly but had to settle for a draw after Eyoma was sent off for two bookings. Janssen had another hour and looked a lot better linking well with Sterling. Spurs finished the month in 9th place. Spurs second game was at Norwich on the 18th at their training ground. Spurs had difficulty breaking the home side down until Oakley-Boothe played a one two with Janssen to score. Norwich responded quickly to go in at halftime level. Halfway through the second half Spurs again took the lead with another one two by Roles with Janssen. Norwich bundled the ball in following a corner for 2-2 which saw Austin sustain a bad injury that saw him go to hospital. Tainio went in goal as we had used all our subs for the rest of the game making one save to see out the game. The point puts Spurs top of the group needing a point from their last game to go into the next round. The last group game was at Stevenage on the 23rd against Atletico Bilbao on a cold night. With both sides able to top the group it was a good attacking game that produced nine goals. Spurs were quickest off the mark with Janssen scoring after two minutes making a 30yd. run to finish off an attack he started. Roles scored from a free kick that he won before Bilbao pulled one back before the break. Bilbao had finished the first half on top and they continued into the second winning a penalty early. De Bie save it but the spanish were level on 60 minutes and in front four minutes later. Spurs responded quickly with Roles second, a one two with Janssen to level. Tracey came off the bench and put Spurs ahead again two minutes later with a good run and finish. Tracey also had a hand in Spurs fifth goal with a cross that was met by Georgiou at the far post. Bilbao scored in added time to make it 5-4 at the final whistle.